Winter CHA - Day 2 - "I'd like to buy a vowel"
Happy 5th Birthday Paper Pickle! What a day! Can't I just live here and soak in the sun on my lunch break and talk to paper craft celebrities all day? This is THE life. I do miss my kiddies though but I know they are in good hands. Thank you to my mom and cousin, Lauren! Kell and I each got pictures with some of our favourite people. Here is a picture of me and Heidi Swapp after watching her demo her new product. Too cool! And here is a picture of Kell with her favourite Tsuki demonstrator. Honestly, she is THE cutest lady. You guys may even get a chance to see her in person.....Stay tuned! I know I am forgetting someone. Well, you get the point. We are definitely working hard so you will see the best product in our store. Ok...after our crazy day of star stalking yesterday, we knew we had to get down to business. We had to cover the second half of the show and we did it! Again, it was an eventful day including one evacuation of the entire convention (yes, for real), one run in with a celebrity (the very petite Vanna White....and no we did not stalk her. We just "happened" to show up at Lion Brand Yarns booth the moment the fashion show with Vanna began) and two very cool classes (one with 7 Gypsies and one with Rusty Pickle). Here is a sneak peek of my 7 Gypsies house album. What a great class. Did you know I am now an official gypsy?? Well, we are coming home with ONE OF EACH OF THE NEW BASIC GREY PAPERS!!!!! The order has been placed and the papers/run-ons/brads are as cool in life as they are on line! The 12x12 paper invisibles by Heidi Swapp were our ABSOLUTE favourite new product hands down! Remember those decoder paper and pens we use to have as kids where you couldn't see the hidden message until the special pen was rubbed over it? Well this is kind of like that but only WAY cooler! The "hidden" messages are beautiful patterns and with just a little ink and technique, these bland white sheets turn into works of art. Heidi Swapp tops our list again with her new Mega Masks. Honestly, our brains are in overload mode with the possibilities for upcoming classes. The new Penny Black stamps were amazing. The wish list became our order as we had NO control whatsoever. Tonight we are working hard at getting a bunch of orders filled out (and trust us, the budget has been blown). I am personally looking forward to sleeping in tomorrow. The "boss" has given me the morning off. Well, not off exactly. Instead of waking up at 5:30AM, I get to sleep in until 7:30AM. I think she realized another 7AM class would have done me in!! We hit the sack at about 11pm (it felt like 2am to us with the time change). I had three alarms set for 6am to get up for our 7am classes, but I was so nervous about not getting up on time. So all of a sudden I woke up (was happy I woke up before hearing the alarm), get up, shower, start putting on my make-up, when all of a sudden Matt taps on the door, looks at me like I have ten heads and says "What are you doing?!?!?" I had no idea what he was talking about, and I say, "I'm getting ready for class!" Then he asks me again what I'm doing, and begins to tells me it is 12:30 in the morning!!! So now we are so excited to tell you about our first day at the show, and how we made out with out to-do-list!!! I took a Ranger mixed medium madness class, with Claudine Hellmuth. It was totally my style where we start with a blank canvas, and learn lots of ways to use products. Here it is.... cool eh? We RAN as fast as we could to Basic Grey, only to realize that they are NOT shipping in priority. Instead, they are shipping by regions. Boy, was there ever a lot of angry out of breath women at that booth! And for Spellbinders, their new releases are AMAZING! Not only do they have all the new dies, but they also new "Impressabilities" that are like a metal embossing folder... they are FABULOUS!!! We were promised to have the new products shipped to us in the first batch... let's cross our fingers!!! Here she is saying hi to Kim!!!! This is how we spent two hours of our day! Not the most productive, but definitely memorable! We cannot help but laugh when we watch this video!! 4 - Not embarrass ourselves around Tim... not today anyway! We watched a bit of his demos and made eye contact with him a couple of times but that was about it. Once again, he continues to amaze us. Tomorrow our plan is to cover the second half of the show. We will give you a complete listing of all the great products we saw over the course of two days. All we can say is trends include: owls, ladybugs, jungle/circus, Indian inspired, major glitter items and mushrooms. Honestly, I don't know if anything can top today! Well, here we are in California! We are so excited for the convention to start. For those of you that do not know, Kell and I are in Anaheim for the Craft & Hobby Associations (CHA) winter convention. This is where all the manufacturers release their latest and greatest. We are like kids in a candy store!! The booths are gorgeous! You see all those famous crafters walking around like Becky Higgins, Tim Holtz, etc. It is so cool. Last time we were here together (2 years ago) we basically stalked Tim Holtz. We hung around his demos for an embarrassingly LONG time! We finally did get the nerve to ask him for a photo with us….that is the one that we just cannot bare to take off our website….yes, we are obsessed! It is our mission to get a new photo with him this time! We will let you know if we embarrass ourselves again or if we decide to lay it cool. It is our plan to keep you posted on all the happenings here in Anaheim. We want you to feel like you are actually here with us! Sorry we couldn’t book a party bus to this show! Each day we will post our to do list and then we will let you know if we crossed everything off. 1. Learn tons of new tips and tricks at our 7AM classes so we can come back and share them with you. I have a sweet Magenta class and Kell is taking a Ranger class. 2. Literally run to the Basic Grey & Spellbinders booths and place our order with them. Note...orders are filled in the order they are placed so you will thank us for all the intensive training we have being doing over the last two weeks when you are working with the NEW Basic Grey before all your friends in other cities! 3. Meet our new BFF ( Paris Hilton) and get a pic with her. Thank you to everyone for coming out to our Birthday party last week! I can't beleive how many people battled the icy, snowy weather to take advantage of our sale! We now made some room to bring in the new! As most of you now, CHA (Craft & Hobby Association) Winter show is next week. This is the largest craft show in the world, where the most new products are released! Kim and I are off to find what's new and what's hot for 2009. I know many people have seen sneak peeks from many of your favourite companies, and have asked us to order. If there is anyone else who has any suggestions, feel free to let us know and we will check it out while we are there. We will keep you guys updated on here next week while we are away! Now for the part you've all been waiting for.. the draw! You can pick up your prizes during regular store hours. Most of you have probably seen the Scrapfest poster hanging in our window. .. it's BACK! Once again it will be in Kitchener at the Aud. The dates this year are Friday April 17 (V.I.P. night), and Saturday April 18th. If you attended last year you know how great of a show it was! Well this year it is going to be even bigger and better!!! There are more vendors, larger area, and more classes with special guest teachers. You can learn all about it at http://www.scrapfest.ca/. 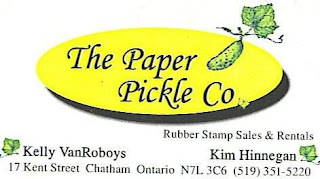 Last year I heard many of you say that you didn't want to drive to Kitchener... we'll what if we had a bus of Pickle People all go up together? I called this week to get prices on renting a bus (coach, not school, but probably not as sweet as the green one in the pic!). I just wanted to throw out the idea first to you girls to see if anyone is interested. The bus would leave Chatham at 7:30am on Saturday, and get to Kitchener right after the doors open at about 9 or 9:30am. You could shop, or sign up for classes that day, and then head home at about 3 or 4pm. 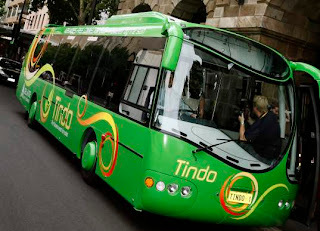 The absolute most it would cost for the day would be $45 for the bus and your admission, but it will go down if we have enough interest for a full size bus. Anyone interested? If you are, you can email me at paperpickle@bellnet.ca (or on here if you want). I will keep you posted if it is a go or not. As you know our birthday celebration is going on until the end of the week. For every $25 you spend, you get a special ballot to enter for a chance to win various goodie packs (five packs in all at approximately $50 retail each). Now I have a way you can get EXTRA ballots. Any of you that have one of our "original" rental membership cards or even just a business card like the one above, bring it in before 3PM on Saturday and receive 10 EXTRA ballots. This will be the true test to see how many of you have cleaned out your wallets over the last five years (just kidding)!!! This card came together so quick! It is all product I've been dying to use, especially the super cute elephant rub-on! The Basic Grey "Ambrosia" line, is one of my absolute favourite lines Basic Grey has ever released! I love every paper, rub-on, chipboard and embellishment in the entire collection! The colours are exactly me. On the inside I used a rub-on from the same package that says "Be Yourself. Everyone else is taken." Cute eh? I'm so excited to see what Basic Grey will come out with next. Kim and I will see in a couple of weeks when we head off to CHA. Last year I was in a crowd with about about 75 other ladies impatiently waiting for the doors to open on the first day of the show. (Basic Grey ships in the order that you arrive at their booth, so you want to make sure you get there early!) The second the doors opened, we all sprinted across the entire convention center, all of us out of breath as we reached the Basic Grey booth just to get our number, I think I was 31. This year I'm training on my Wii Fit... I'm gonna get number 1!!! Lookout Ladies! While I'm still blabbing about Basic Grey, I should show you guys the newest card pack... it's from the new "Bittersweet" line.. too cute... and easy... I made this one night while watching a movie. Barely anything thinking involved. Just what you need some nights when you want to create, but don't want to pull everything out. Eight cards, and they even have envelopes now,...bonus! We've come a LONG way, baby! 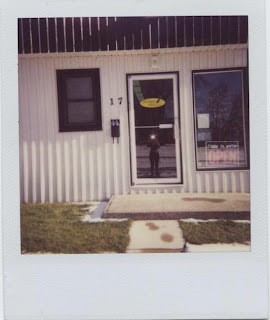 This is a polaroid picture of our original store which was located on Kent Street in Chatham. We rented a small (400 sq. ft.) space from Joe Comiskey. Oh, how we LOVED our little store. It had our same pickle green walls and wall of stamps...just on a much smaller scale. I still remember listening to Hey Ya by Outkast and painting those walls with Kell and my brother, Jeff. Just picture this group of ambitious siblings shake it to that song! ......Shake it like a polaroid picture! That was five years ago and here we are today! And it is all thanks to you! Without your support, we would not be here. I have always been a firm believer in shopping locally and supporting the stores and entrepreneurs that have taken the leap to make a business work (and that is not an easy thing to do in this community!!!!) Everyday we make decisions on where we are going to spend our money. If we choose to spend it with the big guys every time, we should not complain when we see the little guys closing up and we no longer have any selection in our city! Being a small business owner has been a dream come true for me, but has also been the most humbling experience at the same time. Enough of my rambling....let's talk about the sale to celebrate this momentous occasion!!! The entire store will be BUY 1 item, get the 2nd 50% OFF. The only items that are excluded are nestabilities. These will be 15% OFF, as we keep our everyday price on these low. We will also have a ton of Fancy Pants items and other items at 50% OFF. Shop early and often as we like to add items to our sales table each day! Sale runs January 13 to January 17. Oh yeah...we will also be doing a ton of giveaways throughout the week. This will be unlike any sale you have seen at our store before! Please don't mind my formatting on the last email! I am still just catching on to this blog thing. I promise NEXT post will look better!!! Well happy New Year! I hope you all had an amazing holiday. Kell and I had a great Christmas and even had the chance to enjoy a few extra days off but now we are energized and ready for a great 2009! As usual, we have a lot of things up our sleeves...I have a feeling this will be our BEST year yet! Just have a look at the cards Linda and Pauline have come up with for January's schedule. Two very talented ladies...some very wonderful classes! If you haven't taken one of our classes yet, I think you should treat yourself to one! After all the work you did preparing for the holidays, you deserve a little ME time! You can call to reserve a spot in the class (519-351-5220). You must pay within 48 hours of reserving a spot (stop in to store to pay or call with credit card information) or your spot will be released. If for some reason you cannot make it to class, you are responsible for finding a replacement. Linda has two very adorable children's cards for this months class. The cards speak for themselves! This is a pencil crayon class. You will learn Linda's magic of shading and working with pencils and gamsol. You will also work with flocking, patterned paper, the distressing tool, nestabilities and more. Unfortunately, we have to make sympathy cards but many of us don't know how to. You don't want to cards to be too cheery but you don't want them to be too solemn though either. Pauline has created two cards with just the right amount of class. You will work with the nestabilities, the cuttlebug, distress inks and more.